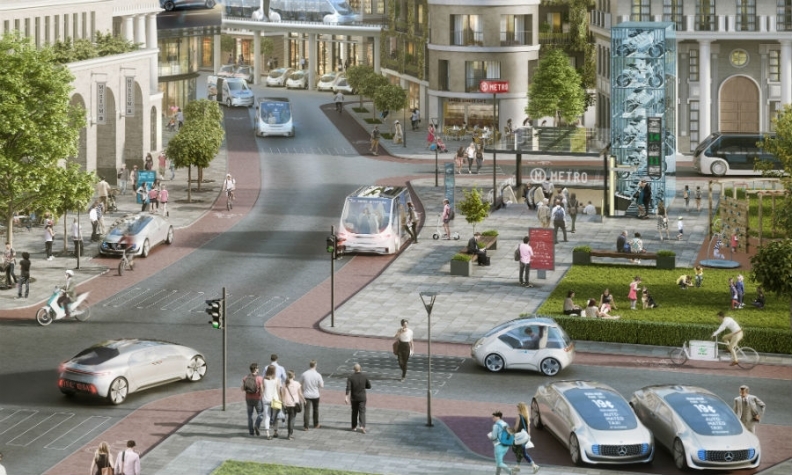 Bosch's vision of future urban mobility with autonomous vehicles. FRANKFURT/DETROIT -- The race to develop and exploit autonomous vehicle technology is reshaping the hierarchy of the automotive industry, replacing traditional top-down manufacturing relationships with complex webs of alliances and acquisitions. Deal making in the automotive and technology industry is driven by the rapid transition of self-driving vehicles from research projects to major elements of near-term product plans at several of the world's biggest automakers. That shift is behind deals like one announced last week between Robert Bosch and Daimler's Mercedes-Benz. Bosch and Mercedes said they will collaborate on development of self-driving vehicles, with Bosch in a broad role as a systems integrator — sort of a copilot with the automaker in speeding up deployment of self-driving vehicles. Bosch also expects to sell the jointly developed systems to other companies. Separately, Silicon Valley chipmaker Intel Corp acquired automotive vision technology leader Mobileye, and has a deal to help German luxury car maker BMW Group develop autonomous vehicles around Intel and Mobileye systems. The first fully self-driving cars are expected to go into production by 2020-2021. Analysts have said self-driving cars will not be in wide use before 2030. "Everybody is trying to understand what skill sets are required to be first in the game (and) if they don't have it, they’re going to partner, invest or purchase," said Xavier Mosquet, a senior partner at Boston Consulting Group and an authority on autonomous vehicles. Major auto companies are rich in engineers schooled in the physics of combustion and collisions, materials science and mechanical systems. The development of self-driving cars demands experts in artificial intelligence, robotics, computer programming and digital networks who work mainly outside the auto industry. Automakers are following different paths to acquire engineering talent. Some are relying on partnerships like the Bosch-Mercedes pact. Others such as General Motors Co are going it alone, buying self-driving vehicle startups and building technology in-house. Alphabet Inc's Waymo and auto supplier Delphi Automotive are offering turn-key systems to companies such as Fiat Chrysler Automobiles that are choosing not to invest in their own autonomous driving systems. Some of the car companies and large suppliers could wind up as competitors. BMW has said it wants to sell its self-driving systems to other manufacturers, as does Delphi, which is developing a system of its own. Intel and Mobileye are partners in both ventures. The Dutch provider of high-definition maps, HERE, has taken a position at the center for several supplier webs. HERE is jointly owned by Daimler, BMW, and Audi. Intel owns a minority stake in HERE, and rival chipmaker Nvidia Corp has a partnership deal. Nvidia itself wants to be a provider of powerful computer chips and "deep learning" software for self-driving cars to a broad array of customers, including rivals such as Mercedes and Tesla, competing mega-suppliers such as Bosch and ZF Friedrichshafen and Chinese tech companies Baidu and Tencent Holdings. The vehicle manufacturers are divided on how much self-driving development and integration to farm out to the suppliers, or whether to keep most of that in-house - as they have done for decades with much of their core engine technology. "At the moment, the carmaker is at an advantage since it knows how the components all fit together," said Mercedes executive Christoph von Hugo. BCG's Mosquet believes the industry may not settle on a single template for collaboration, given the complexity of autonomous vehicles and their underlying technology. "These different approaches will have to pass the test of time," he said. "In two or three years, we will see who has been successful with which approach."